Fats Navarro was a great, original, bop trumpet player. He was one of the first great bop trumpet virtuosos. Fats Navarro was born on September 24 , 1923 and died on July 7, 1950. His recent ancestors were Cuban, African, and Chinese. He was born in Key West Florida and began piano lessons at the age of six. At the age of thirteen, Fats [Theodore] began to study trumpet and he studied both trumpet and tenor saxophone in high school. After graduating from high school, Fats Navarro left for Orlando where he joined Sol Albright’s band and traveled to the midwest. He joined Snookum Russell’s big band, based in Indianapolis and spent a couple of formative years in that big band. He became the lead trumpet soloist in the band and played in a style similar to the style of Roy Eldridge. Perhaps Navarro’s saxophone background also contributed to his playing style with more woodwind style runs and fewer brass style arpeggios than most other trumpeters. After Russell’s band he moved on to Andy Kirk and his “Clouds of Joy” which was Kansas City based. He sat second chair to and was greatly influenced by Howard McGhee in that band. During this timethe legendary Billy Eckstine big band was in existence. When Dizzy Gillespie left that band, he recommended Fats to Eckstine to take his place. Fats accepted and according to Billy Eckstine, the transition from Dizzy Gillespie to Fats Navarro was so smooth that one could hardly notice Dizzy Gillespie had left the band. Eckstine said that while Fats did not copy Dizzy’s solos note for note, his feeling was the same and there was just as much swing as there was with Dizzy. “Fat Girl" Navarro left Eckstine after about a year and a half for small combo work in New York. In the context of a small combo, Fats was able to develop and showcase his virtuoso playing on the trumpet. He recorded with such luminaries as Kenny Clarke, Dexter Gordon, Coleman Hawkins , and most particularly Tadd Dameron. He played on scores of great recordings in New York in 1947 as a featured sideman and he unfortunately also developed a heroin addiction. Navarro already had a weak constitution which was being further weakened by tuberculosis. The addition of a heroin addiction would lead to his quick, untimely death. When the 1948 recording strike ended Navarro was again cutting recordings, most often with Tadd Dameron. He was winning jazz polls as the best trumpet player and generally considered the peer of Dizzy Gillespie. Both Gillespie and Navarro developed their styles based to a large degree on the style of Roy Eldridge. Unlike Eldridge, Navarro did not crack his notes and did not place as much emphasis on chance taking and high note pyrotechnics. Compared to Dizzy Gillespie, he played more in the middle register and less in the upper register [although he could play very high when he wanted to]. Navarro’s tone was bigger and sweeter than the Gillespie’s tone and his playing style a little more deliberate and less flashy. In 1949, his health rapidly declined and his recording dates became less frequent and his playing less forceful although still quite brilliant. He died in July of 1950. His career was not long in length and his recordings not well-known except to jazz aficionados. His influence on players after him was nevertheless extensive. The great Clifford Brown adopted, extended and refined Navarro’s style in his own tragically short career. 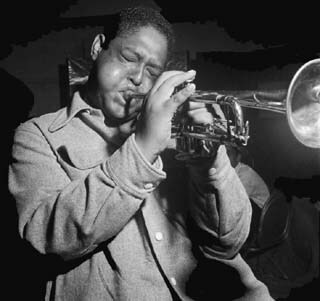 And largely through Clifford Brown, the trumpet playing of Fats Navarro had an effect on almost every jazz trumpeter after them.